Our portfolio is represented by solid wood furniture from the best manufacturers. You can choose and buy furniture made of natural wood for a country house, office or luxury apartments priced at factory price. Our company will help you to make the delivery and assembly of furniture made of solid or upholstered furniture made of genuine leather. to order, you can choose the tinted wooden facades Furniture patinated or "antique". For the manufacture of furniture to order made of wood we produce a design project will do the calculation and free prices. Wholesale customers discounts. All customers can participate in promotions with gifts. 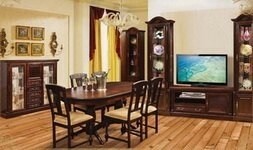 On all the furniture is spread extended manufacturer's warranty. Our catalog contains a wide range of products from wood: Sets of furniture in the living room, made from valuable types of wood (walls, cupboards, cabinets, dressers, windows, tables, chairs), sets leather upholstery array in the living room (sofa beds and corner sofas, ottomans, armchairs, footstools), sets of furniture in the nursery of natural wood, furniture and office furniture bibilioteki, furniture in the bedroom and hallway. 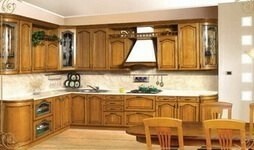 We also manufacture and install kitchen furniture to order from oak, ash, birch, alder, pine and other wood species. Manufacture of furniture made of solid wood (oak, beech, ash) is a complex, time-consuming and energy-consuming. To produce oak furniture must have certain skills and experience, as well as hold some secrets in the wood, which knowledge comes only after many years of production and research. It has become a tradition since the Soviet Union that all major production furniture from wood placed in Belarus, where he gained extensive experience in the preparation and processing of oak, ash, pine, birch and other woods. Large funds were allocated for the construction of large woodworking mills and furniture factories with a full cycle of wood - from fuel pellets to exclusive furniture made of natural wood wide price range. 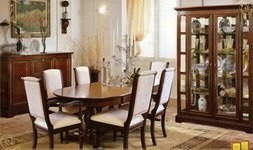 Hallmark Belarusian manufacturers is the furniture of oak massive, which grows and is processed here. 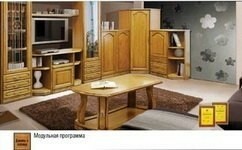 Oak furniture manufacture of Belarus is known in many countries of the world, the demand for it is growing. Cheap energy, relatively cheap labor, favorable geographical location of the Republic and advanced logistics allow local manufacturers to produce products at low prices and deliver it anywhere in the world quickly and not expensive. 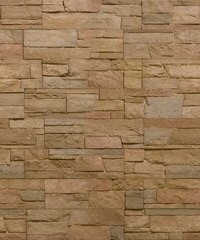 Our web site is a catalog of furniture from an array of leading manufacturers. You can select and order delivery to any city furniture submitted photo catalog. To the extent that the written requests to our email our managers will provide information about the possible timing of delivery of furniture to the nearest authorized dealer wholesale warehouse or store brand products.